I have very fond memories of steaming unhusked corn in the microwave. It was easy, convenient, and an absolutely reliable technique for maximizing corn’s delicious flavor. But last year I decided to put my microwave to rest, having read enough to convince me that nutrients are destroyed when food is cooked in that strange little box. So, when pressure cooker devotee Rita Yaezel wrote me about using the same basic technique in the pressure cooker, I was delighted. Here are Rita’s thorough instructions. Thanks Rita! should work for any number of ears. Thanks, Ken, for the inspiration! 1. Insert rack into a 4-quart or larger pressure cooker and add the 1 cup water. NOTE FROM LORNA: you can also stand the ears upright; trim them as needed to fit, and be sure they are not blocking a vent or the pressure cooker regulator. 3. Seal the lid and bring to high pressure. 6. Remove corn from cooker with tongs. 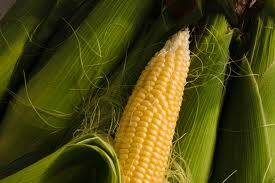 When cool enough to handle, cut off the stem end of each ear at its widest point close to the stem. Please forgive a question about black bean on this recipe post, but I’ve searched your site and others and can’t find a solution. I have your Pressure Perfect cookbook and I love it. I’m fairly new to pressure cooking, so maybe my problem is more a trial and error type of thing. I’m having a hard time getting black bean right. I like to pre-soak my beans overnight, and this morning I decided to cut the cooking time even more since my last attempt. I used High pressure (as indicated in your book), cooked for 7 minutes (since my last attempt was so mushy) and used Natural Release (as indicated in the book). They are still mushy. Can you tell me what I’m doing wrong? Other beans (except chickpeas – I’ve perfected those) have also turned out mushy. Thanks so much! My pressure cooker didn’t come with a rack. How do I know what kind to buy? Is there a way to imporvise one? I only want to make 2 cobs at a time – do I really need one? Yup, it’s fine to cook the cobs w/o a rack. Enjoy!